As Hurricane Irene approached the mid-Atlantic coast in 2011, the Coast Guard was growing concerned about the potential for storm surge to inundate their Command Center in Portsmouth, Virginia. They had a Continuity-of-Operations (COOP) plan for evacuating their staff to a designated secondary command center in Missouri, but they needed solid guidance on the timing and depth of storm surge at their location to make a go/no-go decision. 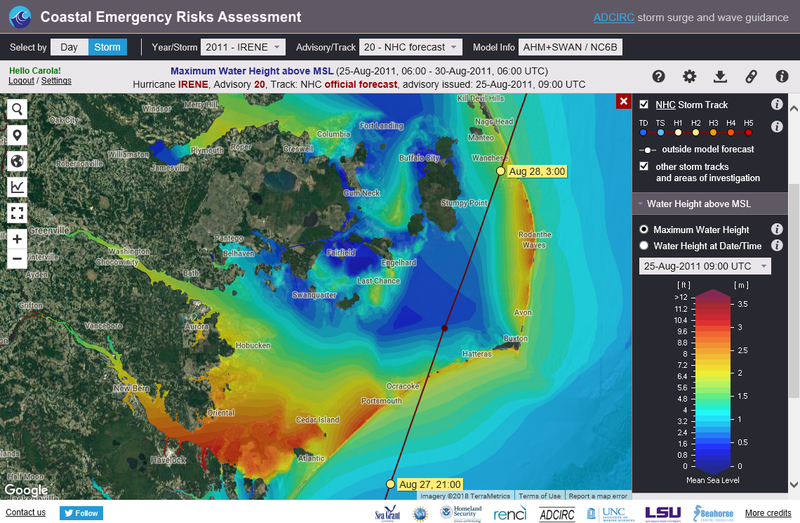 At the same time, we were producing and updating our ADCIRC storm surge live guidance for every new Irene forecast advisory and displaying it on the CERA site. Two Coast Guard Admirals personally sat down with CERA and used it to explore the latest guidance. It indicated that the future flood level at their Command Center was likely to be high enough to degrade or eliminate their command and control, but also there was enough time to activate their COOP plan. They made the decision evacuate to Missouri while continuing to monitor their primary command center in Virginia. After successful execution of their COOP plan, they watched as Irene’s flood waters rose and then peaked at the predicted time, causing their Virginia command center to go dark while Coast Guard operations safely continued as normal from Missouri.